I was gifted a copy of the the Deer and Doe Narcisse Pants pattern from the designers as part of Sew Fancy Pants month. As I mentioned also in my inspirations post, I had never really noticed all the great style lines and features of Narcisse. 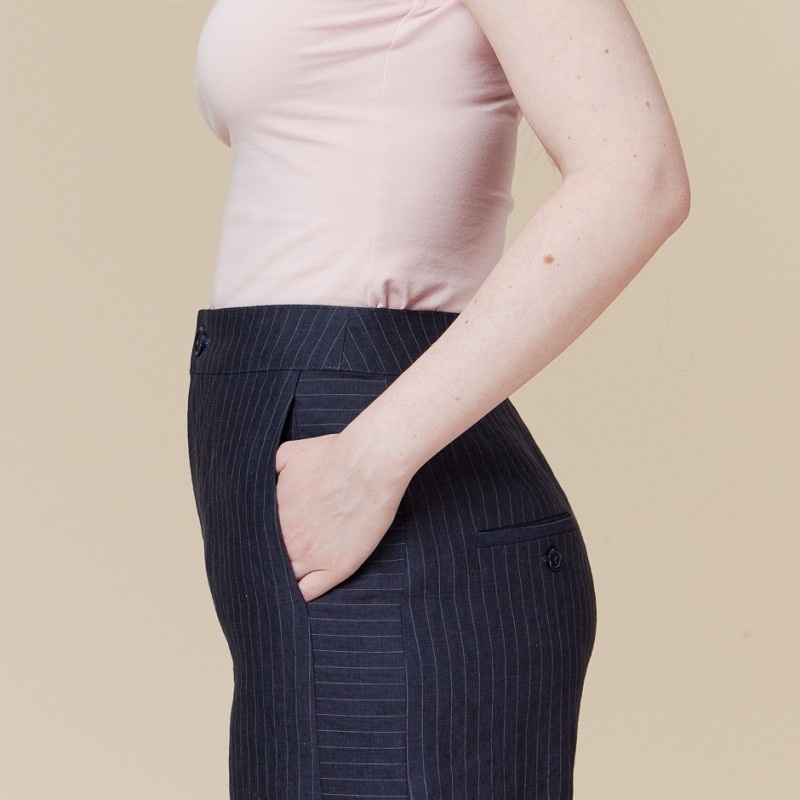 They are high-waisted (aka totally on trend) with in-seam pockets in the front, accent side panels, and welt pockets in the back, designed to be sewn with woven fabrics (non-stretch). 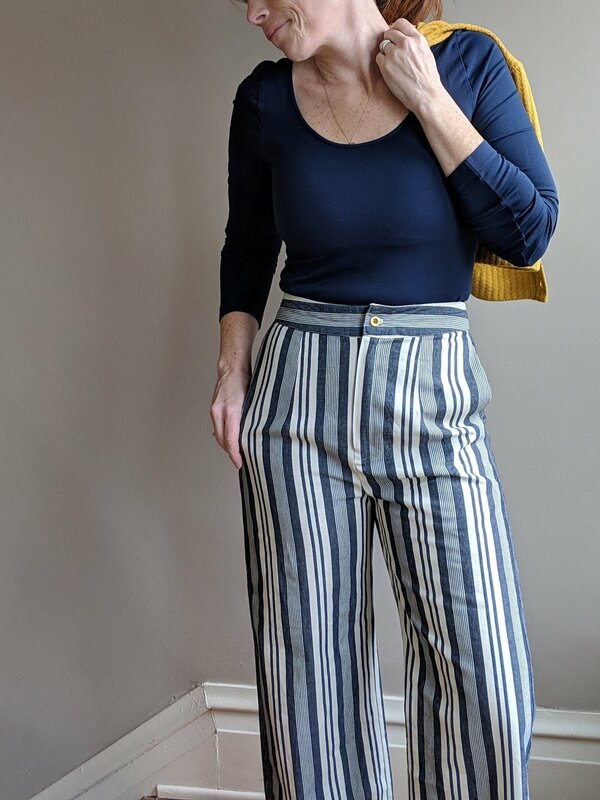 I was instantly excited to dive in and bought some lightweight striped denim from Raspberry Creek Fabrics specifically for these pants and pulled some hemp ticking (sourced from La Mercerie) from my stash for the side panels. The construction order and methods were a bit different from many of the pants I’ve assembled before so I took my time and followed the assembly instructions closely. I know some sewers want to stick with what works for them (I’m looking at you, G) and seldom switch up their sewing repertoire, but I enjoy the process as much as the product. So I welcome new sewing adventures! Truly. One of my challenges in making these pants was that the overhead lights went out in my sewing space. We still haven’t figured out why and we’re waiting on an electrician to come to the rescue. My sewing machine and several other outlets had power so I’d been working under lamps. All to say I had a little trouble with one of my welt pockets and I’m gonna go ahead and put the blame on the poor lighting conditions. My issue was that I didn’t quite have much of a “triangle” at one end to secure and ended up with a bit of a hole. Some of my attempts to fix it made the situation worse. 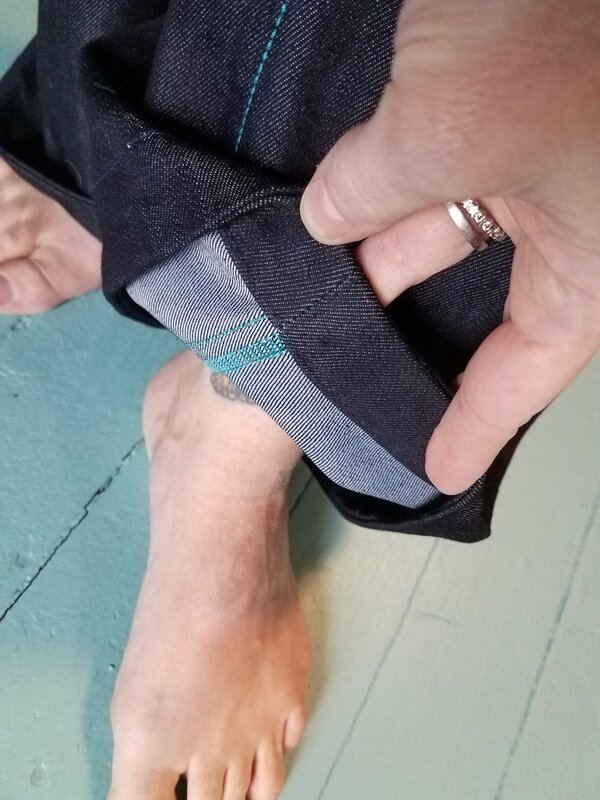 I finally decided to do some darning that mimicked the stripes in the denim and call it good. I also had some fitting woes and nearly decided to give up on making these pants work. I think balancing the wide legs and stripes with my short-ish (5”5”) frame was where I was hung up. I tried slimming the legs a bit and then worked on the waist fit (perpetually an issue for me). Now, I haven’t sewn many non-stretch pants and I think I ended up over-fitting these a bit and maybe there’s a crotch or thigh fit issue I still need to explore (some photos show the fabric bulging in the front around the pelvis, and I’m constantly tugging the legs down). But they are wearable and I think they came out really cute! You might notice the new cardigan I whipped up to complete the outfit. 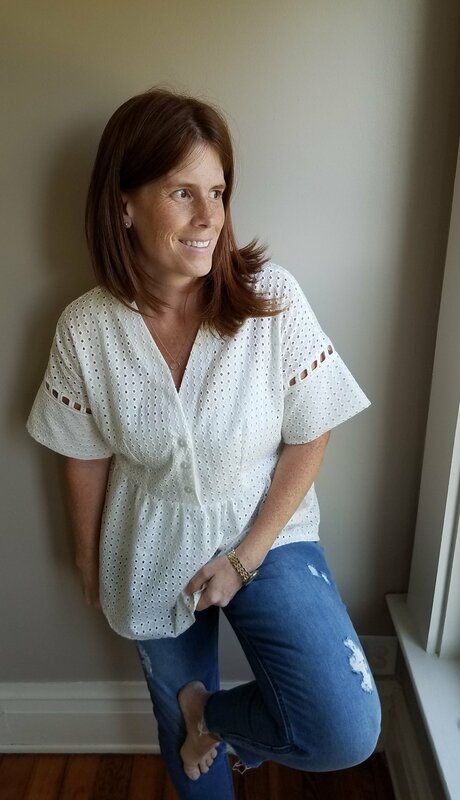 The pattern is the Jenna cardi by Muse. I made the cropped length with short sleeves and a cuff which ends up being elbow length for me. I wish I had a layering tank in the right shade of navy blue for this outfit. I subbed in a long sleeve rtw bodysuit. I used the same buttons on my cardi as my Narcisse pants. I hope you’re joining us in sewing fancy pants this month. I’m having sew much fun, naturally! If you’re looking for the master list of sales, it’s here. I’m open to recommendations for bodysuit or slim top patterns I can sew to wear with these. Let me know what you love. Adrienne? Nikko? 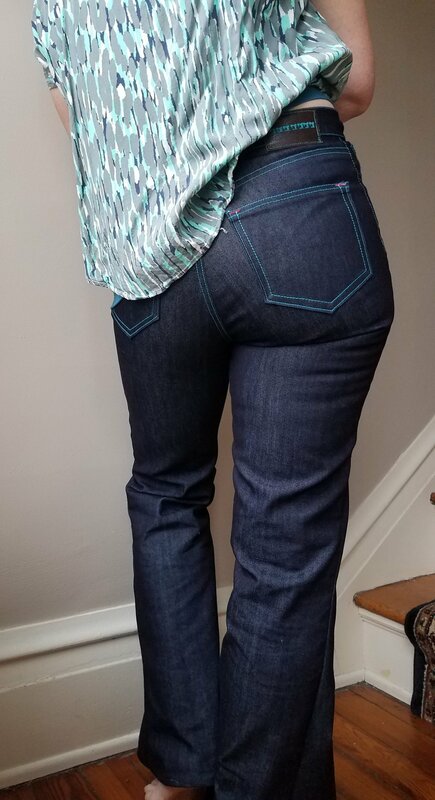 I finally made jeans! You know because it's a new year and everybody is ambitiously getting after their goals. And it's infectious. So I finally sewed the Birkins pattern I purchased nearly 2 years ago. Focus, Loni. We're here for the jeans. Right. So I wear skinny jeans. But 2 years ago, before I could barely follow a sewing pattern, I purchased that spring collection. So while I would probably pick the Ginger jean pattern if I were to buy a pattern today, I thought I ought to at least sew the Birkins. Maybe I'd find out that jeans are too complicated to either construct or fit, maybe both! And it would be silly to spend another $14 to find that out. So my first pair of jeans were Birkins. 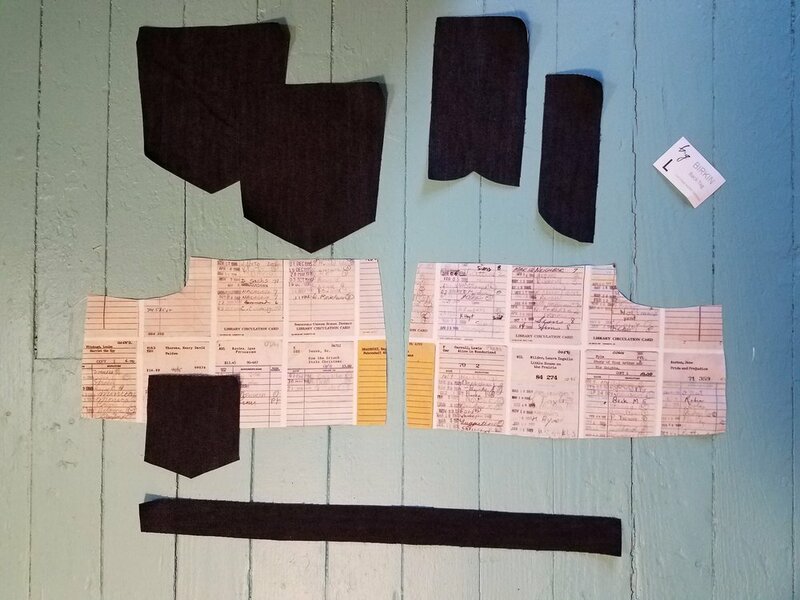 I had heard you might expect to make several muslins before getting the fit right, so I bought stretch denim from Raspberry Creek Fabrics in August 2017 and then again in late November. (They still have some great options, but the listings for the varieties I purchased seem to be expired.) And I had the pattern cut out for probably all of December and there they sat half under the cutting table for weeks. 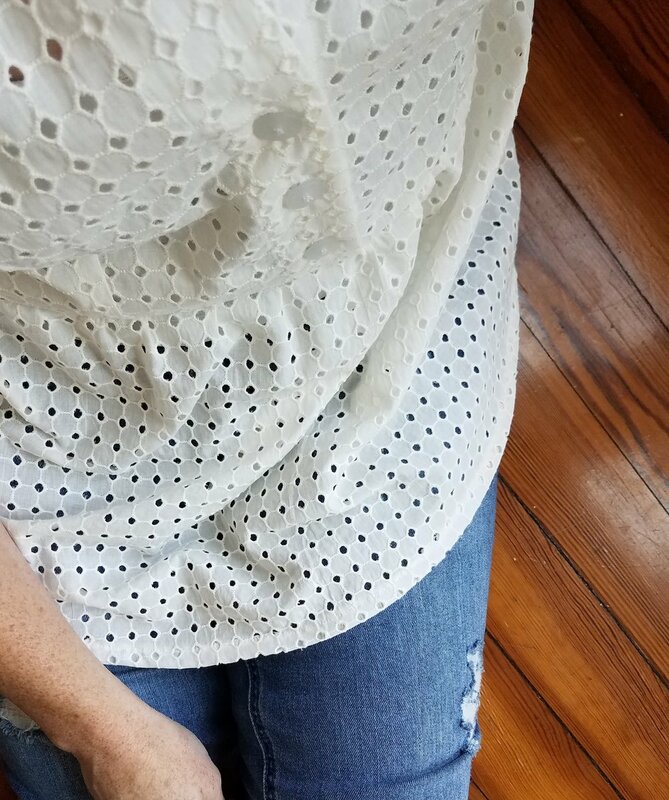 My body measurements had put me in a solidly in size 30 and I had chosen to cut size 29 based on the finished measurements, the expected amount of negative ease, and the experience of a friend with the same measurements. It took a bit more encouragment from that same sewing friend and another one to get me to actually cut the denim. 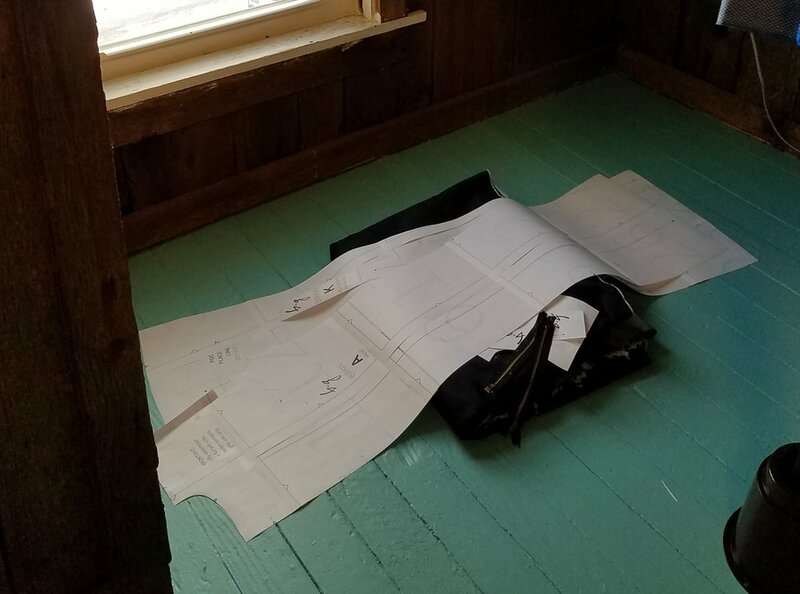 The pattern explains there's 3 approaches to making a muslin, and really all you need to do is baste the fronts, backs, yokes, and pocket facings together to get reasonable idea of the fit. And it wasn't so bad! Just a few seams and JEANS. I mean there's no fly, pockets or waistband, but close enough right? I tried them on and they were surprisingly a very decent fit. The one potential issue I saw was a small gape at the top of the yoke. I hadn't basted on a waistband, so I was hoping that would help, but this is a common fit issue I have with ready to wear pants too. If the hips and thighs fit, the waist has a gape in the back. So I cut out the other essentials. Following the assembly instructions, the back comes together first. This was my first experience using a heavy top stitch thread. 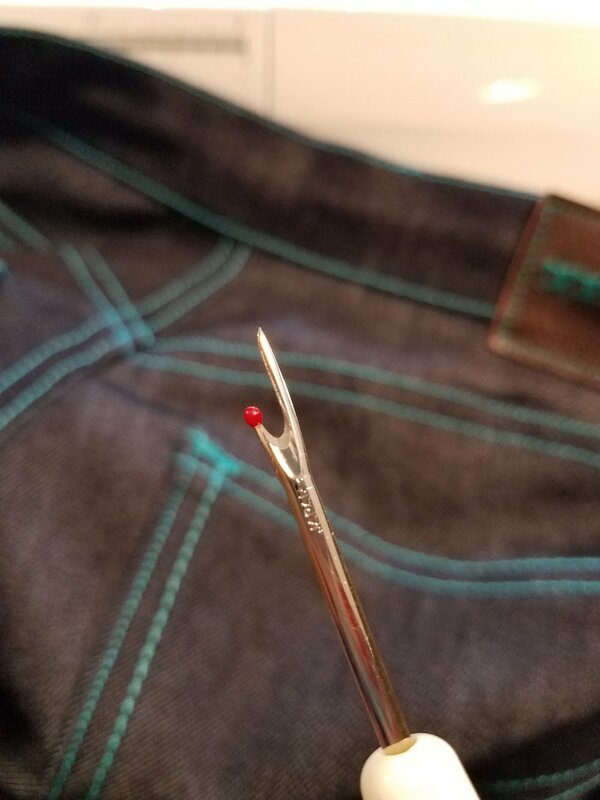 You need a top stitch needle (which has a large eye) to accommodate the thick thread. There's room for improvement, of course! And then the fronts. You're looking at my first real fly! Instead of tracing the fly template onto the fabric, I just pinned it on and followed the edge of the paper closely. After the outside line of stitching was complete, I stitched a parallel line just inside. This worked well for me. Pulling the teeth on the zipper to shorten it is kinda fun too. I think the right pliers help. Get yourself some needle nose pliers for this job. I took 7 teeth out of each side (14 total) to clear the 5/8" seam allowance. And then I ripped all the bar tacks out to put contrasting, red, ones in. I used a scrap of leather to add a tag. It was a swatch of leather from ordering a couch! A few little sewing machines for flair. I left off the belt loops since I never wear belts. Sadly, my fly gapes a bit when worn. But it's not enough to keep me from wearing them, though and I wore them for 2 days straight right away. I just style them with a layering tank anyway. I'm 5'5" and I ended up taking 4" inches (2" above the knee and 2" below) off the total length because I thought they were 6" too long. Seems I was too aggressive there. I'll only take 3" off next time. To compensate for my mistake, I added a hem facing to finish this pair. Overall, I'd say these are a sewing win. Lots of sewing firsts and plenty of experience gained. The actually sewing isn't that difficult, so don't let that intimidate you. I certainly grew to love the flared silhouette even though it's not a style I typically gravitate toward. (I'll probably pick up the Ginger jeans pattern next time I see it on sale.) And the fit issue I noticed was the same one I have with rtw. I will definitely be sewing more jeans for myself!